You feel like going to a good Lebanese restaurant? Daou will probably be what you're looking for. The menu offers a good variety of traditional dishes and, if you have trouble deciding what you should eat, you can always try one of their combinations. The ambiance is pleasant, but the restaurant is very simply furnished and lacks a bit of warmth. Also, the service isn't always the same. The waiters are very professional but some are a bit distant, maybe even uninterested. Still, we've always found our experience at Daou's to be very satisfying. Certain owners must spend a fortune on decorating their restaurant. It's certainly the case as far as Hot and Spicy (Le Gourmet) is concerned. Situated on Taschereau boulevard, this is a very nice looking restaurant. Unfortunately, I had forgotten to bring my camera. The bathroom alone would have been worth a couple of pictures (what a sink!). The service was also professional and pretty fast. This restaurant is a bit like a buffet. We are given a menu from which we can order anything, as often as we want. The problem is that the food barely surpasses what we would normally find in a buffet. There are a few exceptions but, overall, there's nothing out of the ordinary. Many dishes either have too much sugar or too much fat. For $26 per person, I would have expected something better. If you're a lover of buffets and you feel you spend too much time walking from one dish to another, you'll probably like this restaurant. If not, you have to ask yourself if a beautiful decor is worth an extra $10 per person. Are we really that prejudiced? We really didn't expect anything particularly good when we decided to visit the restaurant called Mehfil. After all, this is an indian restaurant that really doesn't look all that hot... On a small avenue... In Longueuil. Well, I'm at a loss for words when I try to describe the delicious surprise that awaited us. The interior is pretty and warm. It looks like a family owned restaurant instead of one of those commercial enterprises that seem to abound in and around Montreal. At Mehfil's, not only can you feel like you're in a small restaurant, but it's also capable of welcoming bigger groups. The service is excellent. I don't mean that they offer the highest level of professionalism but rather that the employees sincerely want you to have a pleasant experience. And believe us, we did. Let us not forget the most important point: the meal. In our opinion, the dishes offer an exceptional quality. Honestly, neither Sandra or I are experts in Indian cuisine, but we have tried a few over the years. Without a doubt, this is the one that has impressed us the most. The meals are prepared "with loving care" and even if the portions aren't huge, they are perfectly generous. Here are some of the items we tried during our first two visits: pakoras, seekh kabab, chicken tikka, nân bread, rice, gulab jamun and more. Everything was wonderful. And the price? Between $15 and $25 per person. We strongly recommend that you try it and let us know what you think. You're looking for a restaurant that offers a bit of everything? You and your friends are arguing about what you're going to eat? Pasta? Hamburgers? General Tao chicken? Well, this is the place you need... Maybe. 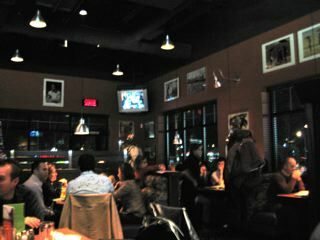 Boston Pizza reminded us of the traditional sports bar / restaurant (somewhat like La Cage aux Sports) that has forgotten to talk about sports. 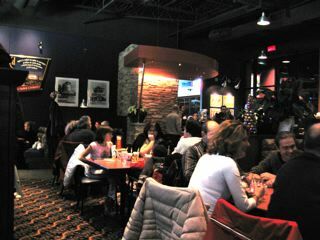 This is the ideal restaurant for a bunch of friends going out or even for a meal with your kids (though you should note that there is also a bar on the premises). The service is very nice. Our waiter joked around and was having fun with the kids from a neighbouring table. The menu is particularly diversified. You'll quickly notice this if you visit their web page. We had the choice between pizzas, hamburgers, pasta, General Tao chicken, etc. Their appetizers are also varied. We tried their cactus potatoes, which are like home made chips served with a spicy sauce. We also tried the chicken wings, a bit spicy, a bit expensive. Sandra tried the "Greek style" pizza (with feta cheese and black olives) and added extra grilled chicken. She found the taste to lack refinement and was a bit disappointed. I decided to try the spicy penne with Italian sausages. They also lacked some refinement and I was a bit disappointed. On the other hand, our teenager loved his pizza. All of our plates were generously filled, even the dessert. We split a "chocolate explosion" cake which was filled with pieces of cheese cake. It was tasty, but not terribly impressive. Our conclusion? This is a simple, honest restaurant that's a bit too expensive for the quality of the meals they offer (about 80$ for three, including tip and a drink from the bar). But since it's open late, it seems ideal for friends that would rather have a good time than a good meal. Apparently, D'Aversa is now closed.How would you like to have a nice night out with a meal followed by some dancing? And what if that meal is hosted by the "happiest man on earth"? And what if, on top of that, the "show" can be listened to on the radio? Well then, this is the restaurant for you! What's that? How's the food? Well, err... How can I put this... Let's start on a positive note! This restaurant is located under the Bell tower, close to Place Bonaventure. Also, the interior parking is free. The ambience is great and it's a very pleasant looking establishment. The service? Wonderful! The waiters were polite, smiling and actually quite nice. D'Aversa is a restaurant that has a pretty good reputation. On Saturday nights, you can dance after (or even before) having had your meal. The whole experience is broadcast on CFQR "Q 92.5" from 8PM to midnight. But our dishes left us wondering if this was the usual level of quality for this restaurant? Sandra asked for manicottis with spinach and cheese. The taste was so bad we both wondered if it had been cooked in sour milk. As for my plate, my seafood pasta tasted pretty good, but the seafood was waaaaaay overcooked. Have you ever had lobster that has the same texture as an overcooked steak? Well, it was my first time. On the other hand, we were told that the lamb was very good. The desert? Everyone had some creme brulee. It was nice, if you like that sort of thing. But as far as choice is concerned, this was rather sad. And expensive. If you had a better experience, please let us know by using the "post a comment" link below this blog entry. Unfortunately, this restaurant is now closed. This restaurant is one of our favourites, but unfortunately not because of it's prices. On the other hand, if you like Italian cuisine (and you have a pretty good budget), you absolutely have to visit this restaurant. The first thing you notice when you arrive is how tightly things are set-up. Some people may even feel cramped. To me, the ceiling seems pretty darn low. The service is excellent though I sometimes find that the waiters have a bit too much "professional distance". Sandra and I were also impressed by the number of "post plastic surgery with too much collagen" hags that could be seen, though I don't believe they are part of the decor since they were eating with their husbands. The menu offers many interesting choices. There's also a table d'hôte and a "dégustation" menu for those that want to sample as many tastes as possible. During our last visit, Sandra had the pleasure of tasting the following dishes: gnocchi piémontaise (they tasted a bit like "a la gigi" pasta), caesar salad (possibly the best that she's ever had) and a very tender filet mignon filled with asparagus and cheese. For my part, I tried the suppli al telefono and a veal stuffed with cheese and mushrooms. Everything was perfectly prepared. The deserts, such as creme caramel, cassata and chocolate mousse cake, are good but no terribly decadent. Such a meal is unfortunately not free, but the cost was in line with the quality of the dishes (about $120 for two). Please note that this restaurant is so popular that the first thing they ask you when you arrive is "What name is your reservation under?". So don't forget to call ahead.